Figuring out how much to charge for an app is not easy. It’s all about finding the right balance between what it costs to produce and promote the application, and how much users are willing to pay for it. The average selling price for applications — across all platforms — continues to decline. Some of that decrease has to do with increased competition. Freemium is the concept of giving away free version of a product while charging for a more advanced version with increased functionality (hence the portmanteau of “free” and “premium”). The idea is that users will love the free version so much, they’ll be more than willing to pay for a paid (better) version. It’s easier to build a strong case for freemium when it comes to gaming. Users start at a very basic level and then evolve and grow their game skills from there. The use case for gamers is more linear, and the paid version is just another step in the game’s path. But it could be completely different when it comes to the applications. The popular Marco Arment’s Instapaper service-and-app reworked it’s free version. Current version has only 2 month of free usage followed by paid-subscription. Instapaper’s reviews have a lot of misunderstandings — users don’t even realize that the app they’re using is limited compared to the full version. 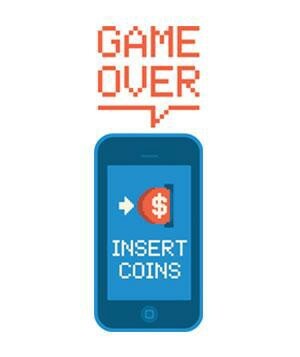 So you have a new game, but what’s the best way to monetize? The “freemium with IAPs” model is a good way to turn a free app into a money magnet. In-app purchases as a share of app store revenue continued to grow in 2015 as subscription revenue made incredible gains, thanks to strong demand for video, music and dating apps. Research by AppAnnie shows that 2%-5% of monthly active users (MAU) were most likely to purchase in-app goods. During 2014, apps with in-app purchases had a 72% revenue increase, while the paid model decreased by 19% and the paidmium model by 24%. There are two ways to set up purchases for games: building in-app payments for each new item you want to introduce (eg: a specific gun or level) or establishing a virtual premium currency. The latter enables more flexibility in terms of content offerings and promotions. In-app advertising is a great way to generate ongoing revenue for your application. You’ll only get paid once for an app download, but you can continue getting paid through in-app advertising. There is a huge range of advertising opportunities — everything from small banners to intrusive pop-overs. But you should remember that it’s very important to find a balance and manage user expectations for how annoying and invasive the ads will be. But charging upfront for an app is clearly not the only way to generate revenue. Many applications are free because they promote or support some other paid service (e.g. Netflix’s app). You’ve already seen Paid and Paidmium revenue dynamics in Advertising section — they both continue to substantially decline, though they can still be successful for the right apps. There are still plenty of apps that are directly aimed at generating revenue but are free. The idea is that giving an app away for free but loading it up with advertising can generate more revenue than a paid app simply because more users will download the free app. One easy way for app publishers to get attention is to temporarily reduce the price of their app to free. It’s not unheard of for apps to drop from $9.99 to free for a “limited time only.” When an app goes from paid to free, the blogosphere usually pays attention. People love getting things for free, and apps are no exception. When users realize they need to act fast to get the app for free, it can create a small whirlwind of buzz. The main reason for dropping the price is attempting to attract a rush of new users. What Is Fair And Reasonable Price? Do Analysis. The first step in determining your app’s price is to do some competitive analysis. What’s the going rate for similar apps, and what are prices of apps in similar categories? Understand User Expectations. Users expect simple apps to be either free or 99 cents. More complex utilities often sell for between $2.99 and $4.99. Apps in the $4.99+ range need to have an expansive feature set and lots of polish. Users will be quick to leave negative feedback if they feel they’ve been ripped off, which will likely turn off future customers. Experiment. App prices aren’t fixed. Leverage the ease with which prices can be changed to experiment with various price points. Try releasing the app with a slightly higher price and then lowering it over time. Identify Your Target Customer. App developers must take into account both their target audience and market. E.g. users in Asia are significantly less inclined to download paid apps than their Western counterparts. In-app purchases also tend to be less robust in the Asian market. Thus, developers often rely on in-app advertising as a primary revenue source in that region. Consider Commissions & Refunds. Apple, for example, famously takes a 30% commission on app sales and in-app purchases (Famous Dirty Percent).When calculating your app’s price, make sure you include the app store’s cut, including any processing fees. Also you must remember an app store return policy. E.g. if pricing your app too high might result in a lot of returns once users see the quality and basic functionality. The key to pricing your app is finding a balance between functionality and user expectations. If they aren’t happy, they’ll tell make it known via comments and ratings. Experiment with different price ranges, and most importantly, don’t rely on the app’s initial sale price to drive revenue.